Colour engraving of the oil painting by Daniel Orme depicting Admiral Nelson receiving the Spanish Admiral's sword on board the San Josef after the Battle of St. Vincent on the 14th February 1797. Nelson is standing centre right of the picture, his right hand held out to receive the sword of the Captain of the ship. He is depicted offering it on bended knee whilst his left hand points to the slumped figure of the Spanish Admiral who has been mortally wounded. Behind them is a Spanish priest holding his cross aloft in his left hand. Between him and Nelson are three British officers and to the right is Captain Berry gesturing towards the San Josef's ensign which has just been hauled down. The man waving his hat on the poop behind is William Fearney, Nelson's bargeman. In the left background are other ships including the San Nicolas which has a Union flag over her ensign. 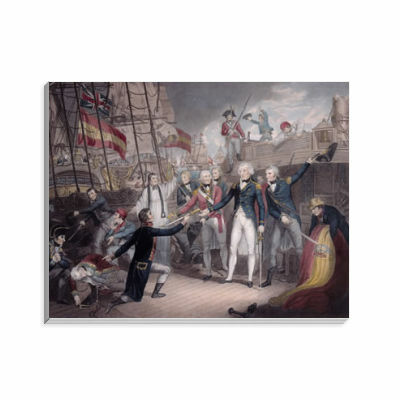 This Admiral Nelson Receiving the Spanish Admiral's Sword, Battle of St. Vincent Notepad is created using state of the art, industry leading Digital printers. The result - a stunning reproduction at an affordable price.